A day after engineering major Larsen & Toubro (L&T) made a hostile bid to take a controlling stake in Mindtree, the managements of both the companies went all out to convince shareholders of their respective stands. While the management of L&T in a hurriedly convened press conference on Tuesday highlighted the synergy of Mindtree with its IT portfolio companies, sounding a conciliatory tone, the promoters of the Bengaluru-based company were in no mood to relent and vowed to fight till finish. They said Mindtree under the current management was well-run and had given maximum returns to the shareholders since going public in 2007. The company now is best placed to protect the interests of the stakeholders, including investors, employees and, most importantly, clients, Executive Chairman Krishnakumar Natarajan said. L&T late on Monday mounted a hostile takeover bid for Mindtree with a multipronged strategy to buy around 67 per cent in the IT services firm for about Rs 10,733 crore. While it has entered into an agreement with Mindtree's single-largest investor, V G Siddhartha, to purchase his entire 20.32 per cent stake for Rs 3,269 crore, it is also eyeing an additional 46 per cent through market purchase and an open offer. “We are reaching out to the fathers and mothers of the Indian IT industry to garner support as this move will be taken as a bad precedent for the whole IT sector and also for startup entrepreneurs who aspire to build large institutions,” said Subroto Bagchi, co-founder of Mindtree. Even though Mindtree did not spell out its next course of action, it is learnt the company is evaluating making a counter offer with the backing of a friendly investor. A decision to this effect is learnt to be on the agenda of the board, which is meeting on Wednesday. The L&T management on Tuesday said the company’s bid to acquire a controlling stake in Mindtree should not be seen as a hostile attempt but a business decision taken in the best interests of its shareholders. The management, led by Chief Executive Officer (CEO) and Managing Director (MD) S N Subrahmanyan said it was Siddhartha who approached its management not once but twice in the past five years with the proposal to sell his stake. 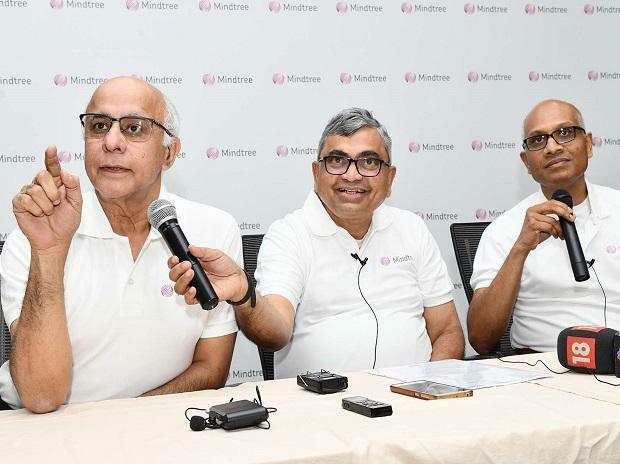 The management reiterated after the successful closure of the open offer, it intended to run Mindtree as an independent listed entity, at least in the short to medium term. “We keep businesses as independent and focused verticals with their own objectives. We are not planning integration, but I cannot say what will happen in the future. Things keep changing with time,” said Subrahmanyan. Market analysts, while finding merit in the deal, say the hostile management team at Mindtree could be cause for concern and jeopardise any plan to delist Mindtree for a full merger with the L&T group’s IT services firm, LTI (L&T Infotech). “We believe this will inevitably lead to a merger of LTI (L&T Infotech) and Mindtree, as L&T is unlikely to retain two listed entities with complementary capabilities in the same industry,” a note by brokerage firm Elara Capital said. The report said with the founders holding 13.3 per cent in Mindtree, it will be difficult to hit the 90 per cent threshold required to delist. “The Mindtree management has made it clear through public statements that it is convinced the L&T stake acquisition is not in the interest of Mindtree stakeholders. We expect L&T to force a merger via share-swap with an attractive swap ratio,” the note added. The Mindtree management said the company had the backing of all its institutional investors and marquee clients. “Since our IPO, we have given returns to our shareholders at a compound annual growth rate of 21 per cent as against 6.6 per cent returns in the Nifty. We will do everything keeping our shareholders in mind,” said Rostow Ravanan, CEO and MD, Mindtree.